If you are seeing various in-text, interstitial, transitional, search-related, banner, and pop-up advertisements every time you browse the web, there is a huge possibility that SmarterPower, which is the newest product of SuperWeb LLC has managed to infiltrate your system. As other programs published by the same company, SmarterPower will not do anything really beneficial even though it claims that it will enhance your browsing experience by providing various tools for searching the web and finding the best deals on various commercial websites (e.g. ebay.com, amazon.com, kmart.com, etc). There is no point in keeping useless applications; thus, we recommend that you remove SmarterPower as quickly as possible. If you do so, you will reduce the possibility to infect the system with malware as well. Even though SmarterPower is not a very serious infection, the specialists of pcthreat.com have found out that this program might expose you to potential infections via ads that it generates. We do not recommend clicking on them if you do not want to experience security-related problems; it is because you will never know whether you are going to be taken to trustworthy websites. SmarterPower itself just uses the service of third-party advertisers; thus, it is not responsible for your safety in any way. We believe that it is rather risky to keep SmarterPower installed on the system, which is why we suggest that you get rid of it as soon as possible. We advise that you ignore all those ads in the meantime because you might download and install different kinds of unreliable software as well. SmarterPower and other applications published by Super Web LLC usually travel bundled with unreliable software, especially freeware. Thus, if you tend to download various applications from the internet, we recommend that you choose trustworthy sources and then install applications attentively. By saying “attentively”, we mean that you should read all the information provided in the setup wizard in order to be able to decline the installation of undesirable software. 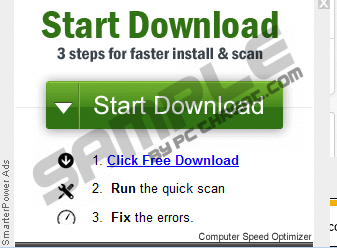 In order to be completely safe, you should install an antimalware tool as well. We have prepared the manual removal instructions in order to help you to delete SmarterPower from the system (scroll down and you will find them below the article). 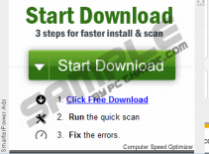 However, if you want to save some time, you should definitely acquire a reliable antimalware tool, for instance, SpyHunter and then perform a full system scan. Another reason why it is worth investing in automatic tools is the fact that they will protect the system 24/7. Quick & tested solution for SmarterPower removal.